Bain or Indian mangrove (avicennia officinalis, family: verbenaceae) is a medium-sized evergreen tree of Mangrove forest with breathing roots. 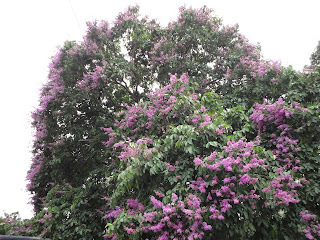 It can get a height of 7-25 m. Young trees are usually bushy-natured and get a large crown. Bark is thin and smooth, pale green in color. It is mainly found on the riverbank and near the sea area of Sundarbans as well as the coasts and islands of South and Southeast Asia. The tree can be identified from a distance by seeing the abundance of fruits. Other names: Kala bain, Baen, Bani, Bol bain, Bina, Telia bain, Sagarodbhutah (Sanskrit). Leaves are thick, simple, entire, petiolate, ovoid-lanceolate, rounded at the end, 8-10 cm long and 3-4 cm wide, opposite, upper-part shiny green, yellowish brown beneath. Midrib is clearly seen, veins are unclear though. Flowers borne in terminal inflorescence. They are bisexual, very small in size, yellow-orange, pungent. Petals 4, unequal, ovoid; stamen 4. Flowering occurs in the summer. Fruit is a capsule, ovoid and thin, yellowish green in color, 2.5-3 cm long, 1-seeded. The germination take place on the waterlogged soil. The fruit is edible; local people eat its fruit. It has great value as fuel. Its bark is used as contraceptive. Honey from its flower is excellent. The fruit is used to get rid of boil. Beside Sundarbans, the tree can also be seen in other coastal forests of Bangladesh.